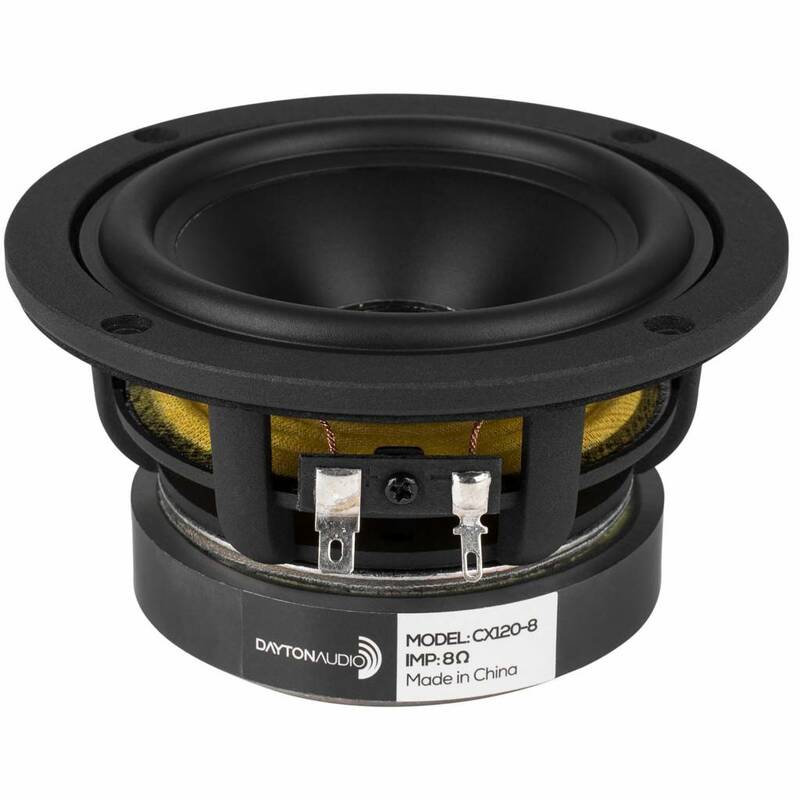 With a natural sounding 3/4" soft dome tweeter concentrically mounted in a long throw poly cone 4" woofer Dayton Audio's CX120-8 will produce extremely smooth response on and off-axis while avoiding the phase and lobing issues associated with standard 2-way designs. This driver is perfect for compact designs, portable speakers, or even custom car audio systems. The Dayton Audio CX120-8 is a full-range coaxial loudspeaker providing high quality sound in a very compact format featuring a 4" curved linear poly cone woofer mated with a 3/4" silk dome tweeter. The poly cone woofer provides a good balance between stiffness, low mass and damping making for a very natural sounding driver with a smooth frequency response. The silk dome tweeter provides detailed and clear high frequencies with minimal distortion. 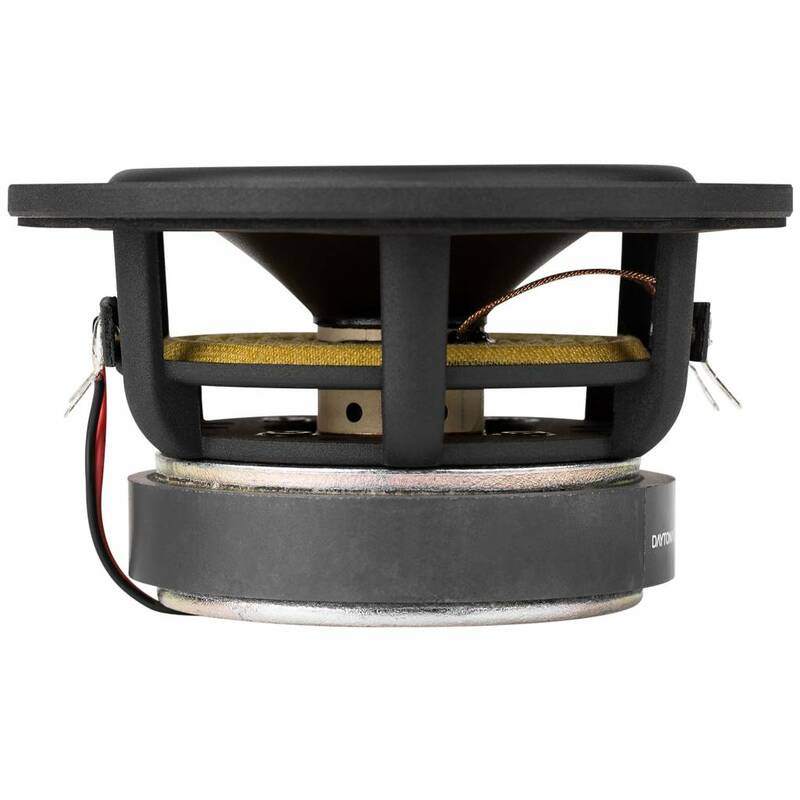 In addition, the optimized tweeter placement and flaring reduces the phase issues with the woofer that is commonplace with even the BIG brand coaxes. Designed for use as a full-range in a small bookshelf speaker, an extended range (i.e. midrange/tweeter) driver in a 3-way system, or even car audio systems. Specifications: • Power handling: 40 watts RMS/80 watts max • VCdia: 1" • Le: 0.62 mH • Impedance: 8 ohms • Re: 6.2 ohms • Frequency response: 90-5,500 Hz • Fs: 87.5 Hz • SPL: 88.5 dB 2.83V/1m • Vas: 0.10 cu. 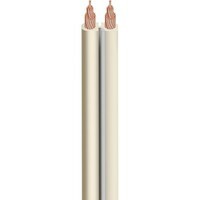 ft. (2.99 liters) • Qms: 2.89 • Qes: 0.57 • Qts: 0.48 • Xmax: 3.0 mm • Dimensions: Overall diameter: 4-3/4", Cutout diameter: 3-7/8", Depth: 2". 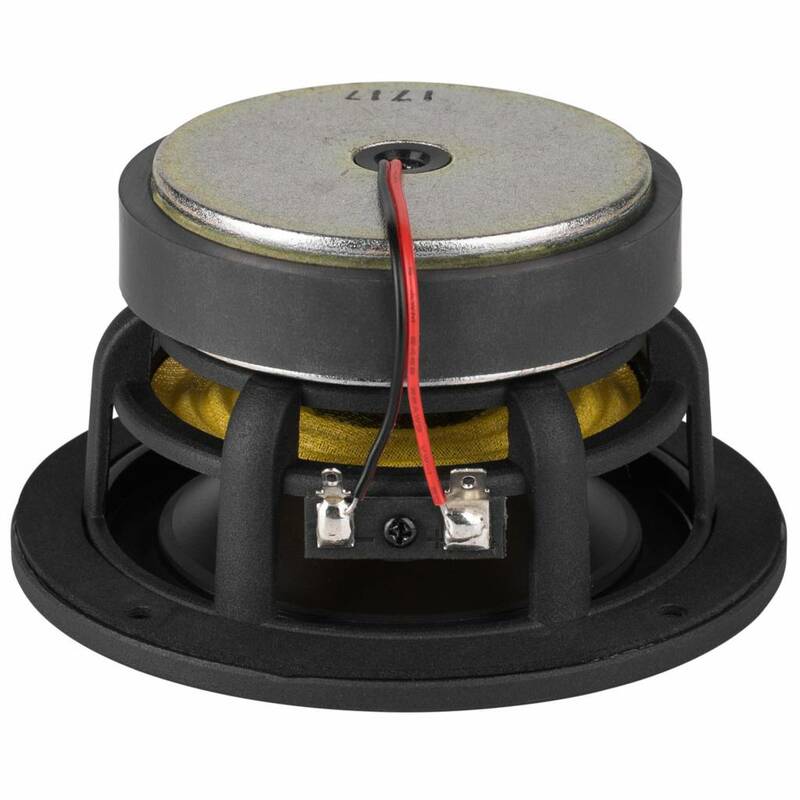 Specifications: • Power handling: 20 watts RMS/40 watts max • VCdia: 3/4" • Le: 0.04 mH @ 10 kHz • Impedance: 8 ohms • Re: 5.6 ohms • Frequency response: 4,500-20,000 Hz • Fs: 2745 Hz • SPL: 89.2 dB 2.83V/1m • Qms: 2.20 • Qes: 7.91 • Qts: 1.72.